Former Secretary of State Hillary Clinton, the subject of endless speculation over whether she will or won't run for the White House in 2016, made it very clear today how she plans to focus much of her time for the next two years. Speaking from the main stage of her family's power-philanthropy conference, the once and possibly future presidential hopeful said she will lead an international effort to evaluate progress made in empowering women and girls worldwide. "Whether we are talking about empowering and connecting women in economics or health care or education or politics, it all comes back to a question of the full and equal participation of women versus their marginalization," Clinton said. Referring specifically to the 1995 United Nations summit of 189 countries on women in Beijing, where she led the U.S. delegation as First Lady, Clinton said there is much work yet to be done. The Beijing summit, she said, had been "a call to action for the global community to insure that women and girls everywhere finally have the opportunities they deserve to live up to their god-given potentials and contribute fully to the progress and prosperity of their societies." But while more girls are now in school and more women hold jobs and serve in public office, Clinton said, "it is still not enough. ...Women and girls still comprise the majority of the world's unhealthy, unfed and unpaid, marginalized in so many ways." The year 2015 will mark 20 years since that conference in Beijing, officially known as the Fourth World Conference on Women. "It's time for a full and clear-eyed look at how far we have come and how far we still have to go, and what we plan to do together about the unfinished business of the 21st century: the full and equal participation of women," Clinton said. Since the Beijing summit, she said, "we've built an international architecture of laws and norms to protect women but it remains a bare scaffold without the bricks and mortar needed to make those laws effective in people's lives and turn our rhetoric into reality." 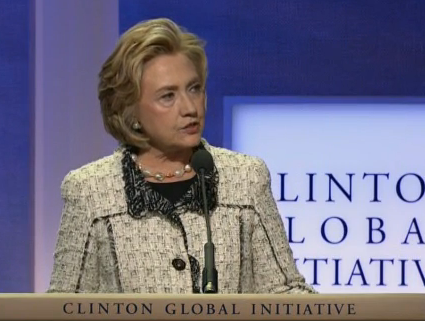 Clinton said her Beijing+20 initiative will work through the Clinton Foundation and leverage the convening power of CGI to bring together partner organizations, NGOs, international institutions, governments, businesses and others to evaluate global progress towards gender equity in time for the September 20, 2015 anniversary of the Beijing summit. She said Beijing+20 will also tap new online feminist networks and social media to encourage broad and global input and participation. The move was generally lauded by political pundits in Washington, who said that throwing herself into the work of her foundation will give Clinton the ability to add to an already formidable network of donors and keep herself current in the national conversation. According to a report by NPR correspondent Mara Liasson, the Ready for Hillary superPAC announced today that it has reached 1 million Facebook supporters. Clinton isn't the first women's rights advocate to push for a formal assessment of how far UN member states and other stakeholders have come in implementing the commitments made at the Beijing summit 20 years ago. In July, the United Nations Economic and Social Council (ECOSOC) adopted a resolution proposed by the Commission on the Status of Women to begin its own review. Ms. Stepanek is a Multimedia Journalist, New Media Strategist, an award-winning news and features editor and author of the forthcoming book, "Swarms: The Rise of the Digital Anti-Establishment." She teaches digital media strategy and cause video at Columbia University, curates a speaker series on disruptive innovation in the advocacy sector and runs a short-form 'micro-documentary' studio in Manhattan. A former Knight Fellow at Stanford and the former Web Strategies Editor at BusinessWeek, Marcia is a frequent speaker on the influence of new media at workshops and conferences worldwide. She was Founding Editor-in-Chief of Contribute magazine, covering the rise of the mass philanthropy movement and the use of social media in advocacy. She blogs for the Stanford Social Innovation Review, Pop!Tech, Videocracy.org and msnbc.com. This blog covers the influence of new media on popular culture, business innovation, social change advocacy, and the workplace. Funders: R U (Really) There?